The tulip tree is a tree between 30 to 35 metres tall of which the foliage is particularly splendid in autumn: the colour of its large leaves turns from dark green to yellow as soon as the weather gets colder. The tulip tree (Liriodendron tulipifera) belongs to the Magnoliaceae family. It is called a tulip tree because its leaves and flowers look like tulips. The bark of this species is smooth when the tree is young, and then develops vertical furrows as it ages. Its deciduous leaves are almost as wide as they are long (8 to 15 centimetres) and hang on the end of a long petiole. The leaves have four lobes, and thus look like tulips when seen from the front. Its flowers only appear after several years. Greenish and orange, also tulip-shaped, they bloom in May and June. Their free carpels transform into winged dry fruit, like raised light brown cones that mature in autumn. This tree comes from the United States, and more specifically Virginia. It was introduced in Versailles in 1771, on the request of Queen Marie-Antoinette. This historic specimen was unfortunately felled by the storm that wreaked havoc in France in 1999. 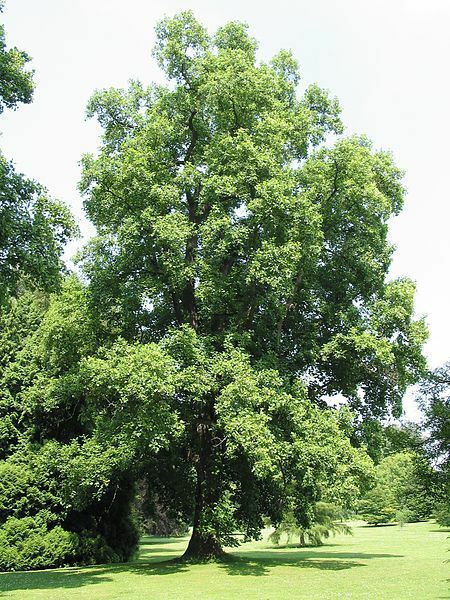 The tulip tree prefers well-drained soil, with a light texture, such as sandy soil or slightly acidic silty soil. It does not grow in very humid places, or in places that are too dry. The wood of this tree, with a brownish-green core, is quite fragile and is used in sculpture.